Welcome to Costa Rica! We will meet you at the San Jose International Airport. Your private transfer will take you North (3.5 hours) to the spectacular Arenal Volcano area. 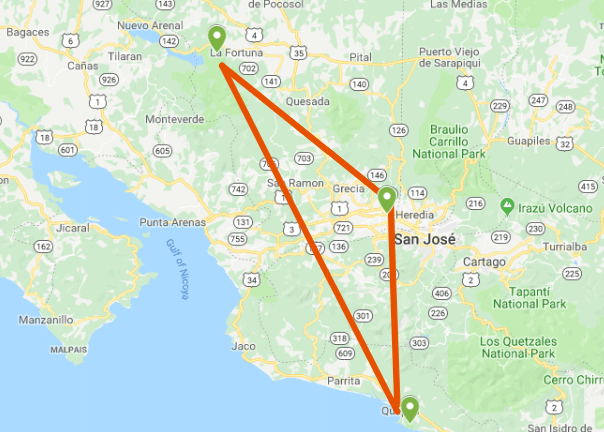 You will leave the city behind and find yourselves traveling through small towns and rolling green hills, through the cloud forest of San Ramon, to the Caribbean. Today you get to enjoy the views of the rainforest from the treetops. Together with your guide, you will board a gondola and after 20 minutes you will reach a wide observation platform where you can take incredible pictures of the lake and the volcano. Next up is the most exciting part of your tour: Canopy Ziplining. After your guide’s safety explanation you will glide through the jungle along 8 zipline cables. You will be picked up from your hotel and driven 20 minutes to the Arenal Volcano National Park. We will be on the lookout for monkeys, birds, and various plant species. After this incredible hike you will head to the luxurious Tabacon thermal hot springs. The thermal hot springs are a true paradise on earth. Enjoy a cocktail at the swim up bar while being immersed in nature. After you feel refreshed and relax we will bring you back to your hotel. Today after breakfast it’s time to move on to the incredible beaches of Manuel Antonio. Stop along the way at the Tarcoles bridge to have a look at the incredible crocodiles. Enjoy these days at leisure or plan for an optional tour. Be sure to explore the local restaurants. This area is well known for great restaurants overlooking the beautiful bay of Manuel Antonio. Today you get to explore Manuel Antonio National Park which is the smallest national park in Costa Rica was listed among the world’s 12 most beautiful national parks by Forbes. Your guide will be on the lookout for the white-faced capuchin monkey, howler monkeys, sloths and much more. This park is where the rainforest meets the ocean and therefore the scenery is just stunning. Today it’s time to bid farewell to Paradise. Your driver will arrive to transfer you to the San Jose International Airport (3 hr. 30 mins.) for your flight home.